Nostalgia can be great. In the past few years, it has motivated many game developers to take their classic 2-D games—previously found only on the likes of the Super Nintendo, the Sega Genesis, and the Gameboy—and port them to modern-day devices like the iPhone. I certainly appreciate the trend, as it’s let me relive many of the games I grew up playing. The downside, of course, is when game makers revive titles that don’t port very well. Case in point: Golden Axe 2, a Sega Genesis game that doesn’t fare very well after the transition to the iPhone and iPod touch. This 2-D side-scrolling action game takes place in the medieval land of Yuria, which is filled with dwarfs, barbarians, Amazons, and others. A peculiar quirk of Yuria is that its citizens whole-heartedly yield allegiance to whoever holds a magical golden axe. That would be the evil Dark Guild at the start of the game. Fortunately, Axe Battler (a barbarian), Gilius Thunderhead (a dwarf), and Tyris Flare (an Amazon), are immune to the golden axe’s power and looking to stop the Dark Guild. 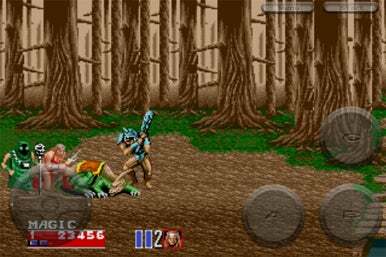 On the Button: Golden Axe 2 recreates the controls for the Sega Genesis right on your iPhone’s screen. That means the virtual buttons—like the D-Pad in this instance—appear over the action. You pick which character to play at the start of Golden Axe 2. Each has a specific weapon, their own magical spell, and a particular defensive move. These character skills may be unique, but they yield the same results—I found it really didn’t matter which character I selected. In a typical Golden Axe 2 level, you walk the streets of Yuria, where you are set upon by a series of creatures spoiling for a fight. Defeat one set of beings, and another group appears to attack you, followed by even more opponents. Eventually, you reach a set of boss creatures—finish them off, and you complete the level. That can get very repetitive very fast. All you get to do in Golden Axe 2 is fight and then fight some more. Which would be all right, if the game’s controls were easier to use. Essentially, Sega took all the buttons of a Sega Genesis controller—including the D-Pad—and shrunk them to fit on your iPhone’s screen. That means you not only see the levels of Golden Axe 2, but all the buttons overlaid on top of the action. It feels a bit cramped, and players with barbarian-sized fingers may have trouble pressing buttons that are awfully close to one another. The iPhone’s touch interface allows for all sorts of interesting control combinations, so it’s a shame Sega chose the control scheme that it did. Even with improved controls, you don’t have that much to do. One game button lets you perform your defensive maneuver, another lets you use your magical spell, and the third lets you use your weapon. You can only use the spell so often—deploying it will drain your magical energy—so you spend most of Golden Axe 2 tapping the weapon and defense buttons repeatedly. Golden Axe 2 looks all right. Yuria’s lands, characters, and structures are eye-catching enough to keep you interested. And there’s a modest improvement over the graphic quality in the original game. I wish I could say the same for the the music, which is crying out for an overhaul. I spent most of my time testing the game feeling like I was stuck in a dated early ’90s TV show. Though I respect Sega’s attempt to revitalize one of its old games, Golden Axe 2 falls short. Its levels are repetitive, its controls not well placed or easy to use, and its sounds are lackluster. Even nostalgic players will conclude this game should have stayed on the Sega Genesis where it belonged.